•Half Off Ponds' Pond Pulse Series is truly a best of breed submersible pump for water gardens, fish ponds and pondless water features. • The high flow, energy efficient hybrid drive technology combines the high flow characteristics of a direct drive pump with the energy saving efficiency of a mag drive pump. 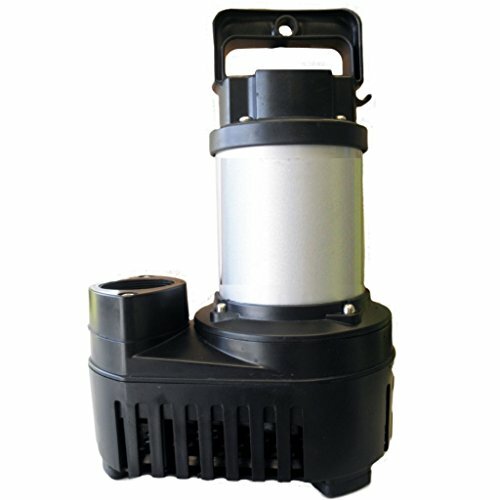 • Upright design with space-saving footprint makes this pump ideal for skimmer and pondless waterfall installations. • Intake screen prevents clogging while passing solids up to .25 inch. • Asynchronous drive motor can be controlled with variable speed controller (not included) that permits you to increase or decrease pump flow as needed. Crank it up for a raging waterfall; back it off for a soothing, gentle flow. • The Pond Pulse series is engineered for 24-hour continuous use; overload sensor prevents burnout. Contains no oil; completely safe for fish, wildlife and aquatic plants. High flow, energy efficient hybrid drive technology combines the high flow characteristics of a direct drive pump with the energy saving efficiency of a mag drive pump. Upright design with space-saving footprint makes this pump ideal for skimmer and pondless waterfall installations. Intake screen prevents clogging while passing solids up to .25 inch. Contains no oil; completely safe for fish, wildlife and aquatic plants. 2-year manufacturer's warranty. If you have any questions about this product by Pond Pulse, contact us by completing and submitting the form below. If you are looking for a specif part number, please include it with your message.